Released in 1957, the Omega Speedmaster is a truly iconic chronograph. After extensive testing, in 1965 NASA chose the Speedmaster as its official chronograph, declaring it ‘flight qualified’ for manned space missions. When Apollo 11 made history in 1969 with the first moon landing, the Speedmaster Professional, often referred to as the “Moonwatch”, was worn by the astronauts. 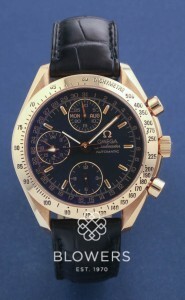 This “first” conferred legendary status upon the Speedmaster. 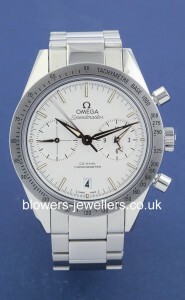 The Speedmaster was the first watch equipped with a tachymeter scale on the bezel. It was this feature which provided the inspiration for the name of the watch. 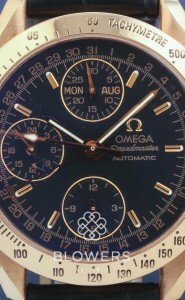 The hand-wound timepiece featured a tri-compax layout and “Broad Arrow” hands. 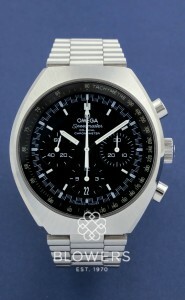 Over the years, Omega has released many versions of the Speedmaster, including reproductions of the historic models. 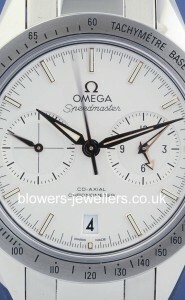 Some Speedmaster models have been delivered in noble metals and equipped with self-winding movements, but they retain many of the design codes of the legendary chronograph. We stock a range of pre-owned Omega watches, which can be viewed at our Kingston-upon-Hull Boutique or by appointment at our office at London Mayfair. All our watches are serviced by our team of experts where required. For further peace of mind, our watches are sold with a minimum 1 to 5-year warranty. Browse our range below or contact us today.